I used to hate them! Actually, I only remember the canned ones from my childhood that were sometimes were served at Thanksgiving. And I remember them as tasting like dirt. But then, a year or so ago, I had them at a restaurant and they were DELICIOUS. But I sort of forgot about them as an option for a side dish. I roast veggies all the time, and beets have absolutely never been on my radar. Maybe it’s because they’ve always intimidated me? They are messy (seriously they will stain your hands! ), and I’ve never knew how to use them! They’re all delicious, but I needed something different. It was time for a NEW type of roasted veggie — beets. During the winter I find it so hard to be creative! 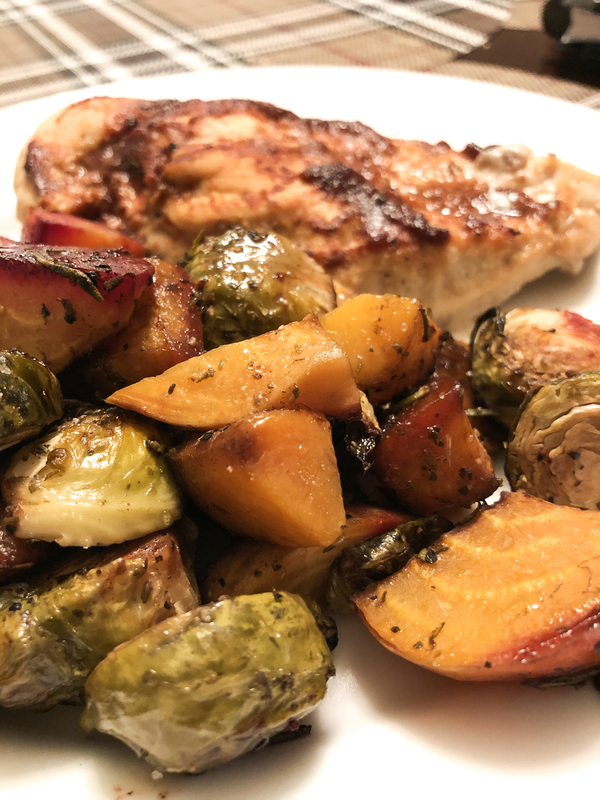 So, I did a quick Pinterest search and saw a recipe that called for beets and I decided to create my own little recipe with the other veggies I had in the fridge: brussels sprouts and butternut squash. I ordered both red and golden beets, and I have to be honest, I still don’t know what to do with the GIANT greens that come on them (if/when I figure it out I’ll write another blog and share with you!). I did know, though, that I’d need gloves in order to prepare the dish. You might think I’m kidding, but trust me, you definitely want to use some sort of glove when handling the beets. They (the red ones particularly) are RED. They stain... your hands, the cutting board, you name it. So, Step #1 – get gloves. What other veggies go with beets? 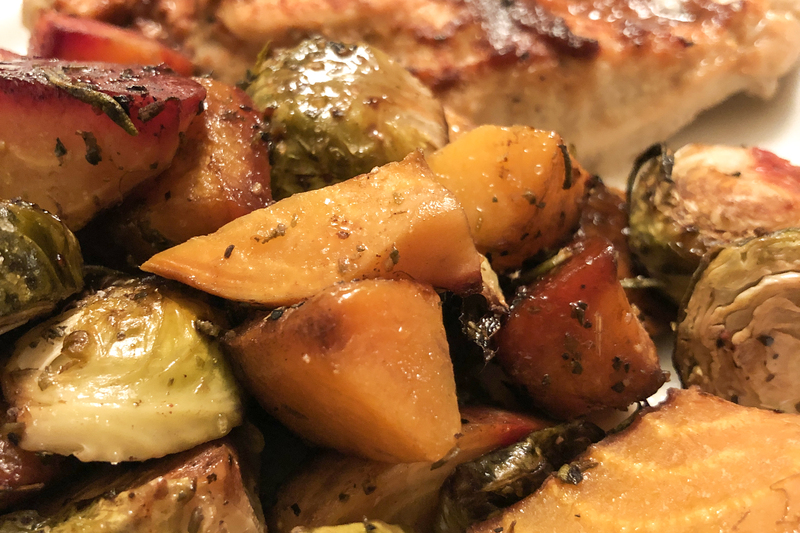 You really could use any veggies you want, but my husband and I found that the combo of beets, brussels sprouts and butternut squash were to DIE for. But we've also used veggies like zucchini, bell peppers, and onion! For my husband to comment multiple times about how good they were, is a big deal. Especially because they are veggies! WOO! I posted the veggies on my Instagram stories (by the way, are we connected there? I often share recipe ideas, food hacks, and more there. you can follow me here: @_shannonleach_). Anyway, I had a huge response from people wanting the recipe, I figured I might as well share it here! And because of the colors, the dish looks beautiful, too! Delicious. Beautiful. Easy. Does it get better than that? Place veggies, rosemary in a large mixing bowl. Sprinkle with Italian herbs, salt/pepper to taste. Toss the vegetables evenly with the olive oil & balsamic vinegar. Mix well and spread evenly on your prepared pan. *Please note, many recipes suggest you peel veggies. I rarely do. I think that there’s a ton of nutrients actually IN the skin of a vegetable. Plus, it’s one less step I have to do! HA!